OK, here we go again. A trip that involves two restaurants. As I mentioned before, always a favorite adventure of mine. And as I mentioned before, the two main reasons are I get to enjoy the food at both and the second reason is I get to enjoy the food at both. Let’s begin at the Horseshoe Casino downtown and a stop at GDL Italian by Giada. Is it necessary for me to mention it’s next to M & T Bank Stadium? I didn’t think so. I was invited there because they were tired of me looking in with a sign that said will read Shakespeare for food. Well, it was either that or they asked me to come in and sample some items on the new brunch menu. Which I happily did. The brunch is offered Saturday and Sunday from 10:30 to 2 p.m. They close at two and re-open for dinner at 5 p.m. Please note that Wednesday through Sunday they serve dinner. The restaurant is beautifully decorated with the lounge located in the middle near the entrance. You can enjoy the city views while dining. Actually, the views look north. There’s seating for about 150. In season you can dine on the deck. Be sure to check out the movie posters that line the walls. Giada is related to famed movie director Dino De Laurentiis. Then there’s the weekday Happy Hour from 4 to 6 and the open kitchen for those who like to watch food preparation. Signature menu entrees include Giada’s chicken parm, yes the always popular spaghetti with turkey meatballs and the salmon with Italian succotash. Signature appetizers include the crab arancini and the kale caesar salad. You may also want to try the margarita or piccante pizza. A restaurant in a casino may not come to mind when deciding where to go for dinner. But this one is worth a try. But be careful, you have to walk through the casino to get in. My advice, keep walking. Save your money for dinner. OK, goodbye downtown and hello Monkton and welcome to The Manor Tavern, 15819 Old York Rd. It began as a stable in 1750 and has come a long way over the years. To my thinking, it is one of the premiere dining establishments in the Baltimore area. It is open for lunch and dinner but let’s talk brunch here. It begins at 10 a.m., lasts until 2 p.m. and dinner follows immediately. You could be seated in any one of their many rooms. Even though there is seating for about 200, reservations are strongly recommended. I ate in the newest room, The Saddle Room, complete with fireplace. This is an order off the menu brunch, not a buffet. Not to worry my friends, there are plenty of choices. My table ordered various items and shared. Not crazy about sharing. Mainly because it seems that everyone wants what I order and they order what I may not like. But I do it, because well that’s the kind of guy I am. I got the chef’s pancakes. Had I known I would be getting three large pancakes, I would have asked for two. 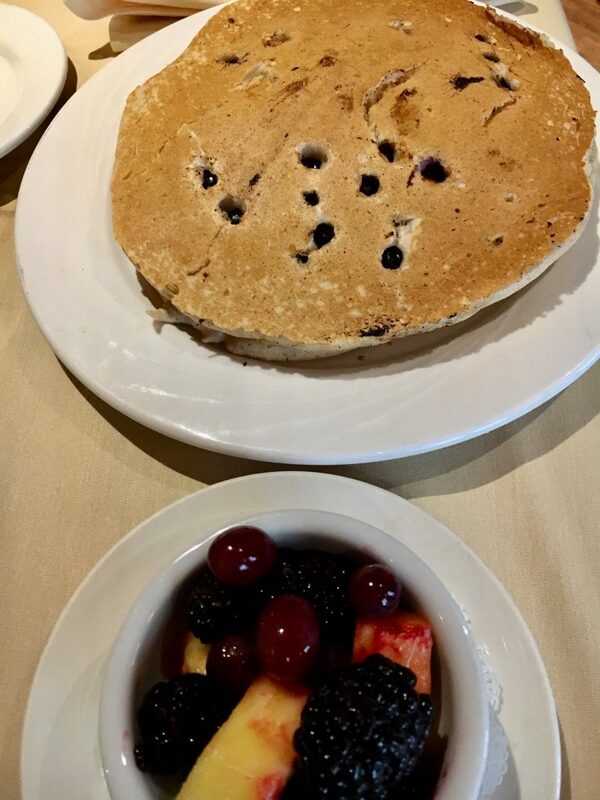 It came with a choice of blueberry, chocolate chip or plain with fresh berries and a side of bacon. Someone else ordered the three eggs any style served with Tavern potatoes and toast. When I asked our server what she would recommend she went with the Nutella stuffed french toast, the shrimp and goat cheese frittata, and the blue crab omelet. Brunch also offers homemade soups, starters, like a salmon plate, eggplant napoleon and hot crab dip, cocktails, and four other omelet choices. Not to mention nine other main dishes. OK, you want examples, the Manor brunch burger, 1/2 rack of ribs, crab benedict, breakfast burrito a, d the scrapple, egg, and cheese sandwich. Desserts are made on premise. There is plenty of free parking, party rooms, come casual and the drive getting there, especially this time of year, is quite nice. Take your time and enjoy the fall colors. The Manor Tavern is open seven days. Every other Monday night you can listen to bluegrass. In season they grow their own veggies in their very own garden. Upcoming events include the Thanksgiving Buffet ($41.95 adults, $16.95 children 3 to 12, under 3 free); Winter Shopping Night November 27, 5 to 9 ($30.00 if you want dinner, but that is not required); and Breakfast with Santa Saturday December 15, with seating at 10 and 12:30 ($22.95 for adults, $12.00 children 3 to 12 and under 3 free). Includes photos with Santa, a children’s craft table and a breakfast buffet. Reservations required.